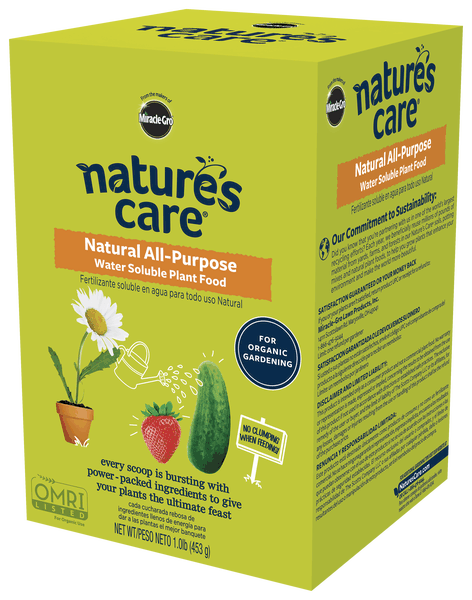 Nature's Care® Natural All-Purpose Water Soluble Plant Food is backed by the creators of Miracle-Gro® and is created with natural goodness for your organic garden. Instantly feed your plants high quality food. Just measure, mix with water and feed! For In Ground Plants and Outdoor Containers: Add two (2) level large scoops to 1 gallon of water, mix and feed. For best results feed every 7-14 days, just soak the soil at the base of each plant to fertilize the roots. For Indoor Plants: Add one (1) level large scoop per gallon of water, mix and feed every two weeks. When using with Miracle-Gro Garden Feeder: For outdoor applications, place 1/2 of the product sleeve into the garden feeder (do not use more than 1/2 at a time). See feeder package for additional instructions. For best results feed every 7 to 14 days, just soak the soil at the base of each plant to fertilize the roots. If planting from live goods (i.e. an established plant; flower, vegetable): feed when first planted, and every 7-14 days after. If planting from seeds: feed once seedlings sprout and start establishing leaves and buds. Feed every 7-14 days from then on. 1/2 lbs. feeds approximately 150 square feet of garden area. Storage:To keep the good stuff inside the box happy between uses be sure to tie the bag once opened and keep away from open air. Keep it Clean:While gardening can be all in good fun, gardening is well... dirty. We like to keep it clean by wearing our trusted gardening gloves when gardening and by washing our hands after. Watering Tips:Be sure to give your plants plenty of water after feeding and water regularly. Try singing (or humming) a little tune such as 'Row, Row, Row Your Boat' to ensure each plant is getting it's fair share of water. Mixing Instructions:Measure right amount of product, based on usage (indoor/outdoor) in spoon provided with product. Mix with water (use a stick or other device to stir). While gardening can be all in good fun, gardening is, well... dirty. We like to keep it clean by wearing gardening gloves and by washing our hands after. If you are making this a family affair, kids need grown up supervision. Our Commitment to Sustainability: Did you know that you're partnering with us in one of the world's largest recycling efforts? Each year, we beneficially reuse millions of pounds of material from yards, farms, and forests in our Nature's Care® soils, potting mixes and natural plant foods, to help you grow plants that enhance your environment and make the world more beautiful. Satisfaction Guaranteed or Your Money Back. If your plants aren't satisfied, return product UPC or receipt to us for a refund. For our address or to contact us, visit our Help Center.